1D is taking the world by storm and you can check out their audition in a video below, just in case you missed their original audition for Simon Cowell and friends. Nickelodeon has recently announced that One Direction or 1D as they are sometimes called will be getting their own TV show on the network. This will not be their first stint on Nickelodeon since the band has already appeared on Nickelodeon’s hit iCarly this year and has toured with Big Time Rush. One Direction seems to in fact have joined the Nick family. They have their own page on Nick.com and are listed on the Nick Stars page of the site. One Direction seems to be the new “British Invasion” that is making young girls swoon across the globe. With such a huge fan base, this new show will no doubt be a huge hit. The group has been burning up the pop music charts and tickets sales for their 2013 tour is rumored to be worth millions. Many sites have said that One Direction is the most popular boy band since the Beatles in the 60’s receiving the same type of fan attention. 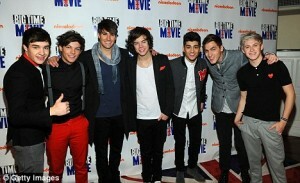 1D also has a documentary in the works that will follow the band around to capture their loves both on tour and off. It will let their millions of fans get a glimpse into their daily lives and personalities. “What Makes You Beautiful” is their hit song and a TV show about 1D will no doubt cement their stardom and keep their momentum rolling. For anyone not familiar with 1D, they are a British-Irish boy band whose members are Niall Horan, Zayn Malik, Liam Payne, Harry Styles and Louis Tomlinson. They signed to Simon Cowell’s record label Syco Records after appearing on X-Factor. So X-Factor, did indeed make these boys stars and their talent and popularity has brought about a new age of the classic Boy Band. The One Direction craze has now found its way to America and the gang is working on projects in the U.S. The boys already have a huge audience and a new One Direction sitcom or docu-series seems like a natural next step that will expose them to millions more and create some huge viewership numbers for their show and the Nickelodeon network. Since the new show is still in the making, we can maybe expect filming to begin later in 2012 for the show to begin airing in 2013. Besides their new TV show, One Direction has tons of other projects in the works which include collaborations, tours, promo deals, guest spots and some ads. Yes, these boys have been very busy lately. 1D is taking America by storm and that storm is about to get larger. The new 1D TV show is still in development so no word yet as to where they will be filming or if they will holding any casting calls for extras or others. I am sure many fans are waiting in anticipation to get more details about the new show and if there is even a chance for fans to attend any casting calls or see a live taping for the new One Direction TV show. Hey I’m a teen from SoCal and my age is 14 years old but I’m going to be 15 in October. I think I should be in this show because…. 2)I believe working with my favorite singers would make my dream come true for acting. Last, I’ll work hard in this show so the show succeeds. Hi, my name is Kaylee and I am 13 turning 14 in August. I am a huge fan of 1D, and it is one of my life goals to meet them. But one of my other life goals is to act and become famous, so I am not only looking at this opportunity to meet my fave boy band but to also have a chance at the big time. I do acting classes at school and I receive straight A’s from all my classes excluding Drama. Hair:Dirty Blond, Curly, Shoulder Height Length, Thin. Hello my name is Angela. I love one direction. I love to act it’s been a dream since I was 7. I’m 11 and i’ll be 12 on March 1st 2014. I have curly brown hair. I have dimples. My eyes are brown and I’m 4’9 tall. I’m in sixth grade and I live in San Antonio TX. Please, if you could have the additions here then it would be AWESOME. Especially since nothing fun like this ever happens in San Antonio TX. Hey my name is Angie. I love the 1D boys and I love to act. It’s been my dream since I was 7 and I’m 11 now. I live in San Antonio Texas. I have dark brown hair it’s also curly. Ok here’s the thing I’ve wanted to be an actress since ever and I want to act for a living more then I want to live because acting is my life. If I could have one chance at this show or any show for that matter I would be happy for the rest of my life even if I do not get the part it just means that I have to improve and keep trying until I get it. So please give me one chance and show you what I have. I have two monologues and one commercial that I am able to audition with. One chance that’s all I ask for. HEY hey HEY hey, My name is Tisha and I am 15 soon to be 16 in April. Performing is my thing and acting is my game. I an randomly unpredictable, full of bubble,s man do I like bubbles, more energy than a lighting bolt, and addicted to being weird, lets face it normal is so pg-13 and I am rated R for RIDICULOUSLY AWESOMETASTIC WITH A GUMMY BEAR ON TOP and loud but you got to love me right… Scratch that you love me. Would like to be in this.. I am 11. I love to act and dance and love 1D. I Would love to have the opportunity to apply for this job. My dream is to be a Model, Actress, or wwe diva. If you know of any modeling jobs or agencies ask them to check out my instagrams. Inspirational quote, if you can dream it, you can do it. -Walt Disney. Hi! I’m Haven and I would love to be on the One Direction Show on Nickelodeon. I am a true directioner, my friends are all directioners. My friends and I always sing their songs. When our teacher says face one direction and my class always laughs. I would love to be on a show because I wouldn’t be all crazy when I’m performing. I will not look at them the whole time and get distracted. I hope that I get the chance to perform with 1D. Thank you for your time. tengo 15 voy para 16(el 25 de julio del 2014). no soy exactamente fanatica de 1D pero me encantaria actuar en este show. soy panameña no hablo mucho el ingles pero aprendo rapido. he actuadas en varias dramatizaciones me aprendo rapido los guiones. soy divertida me encanta los programas de nickelodeon..y como dicen que los sueños se hacen realidad me encantarian que me escogien. hago todo lo posible para actuar y con algo se comienza espero que me contacten porfavor lo espero con tantas ancias y bueno espero que me elijan.. y buena suerte a todos que Dios les bendiga a todos y a la produccion de nick.blessing. elijamen plis. I’m currently a high school senior in Omaha, NE. I have been auditioning and participating in the theatrical arts in my schools since the age of 11. I have performed in about 15 or more shows on stage. I would love to get in front of a camera as well. I am also an Alto in top choir in my high school. I have taken four different types of dance classes for at least a year each. Those are: Ballet, Tap, Jazz, and Hip Hop. I love to have fun but I can be serious when I need/want to be. I can be extremely creative, especially when I am bored. (and sometimes had gotten me into a little bit of trouble). I’m one of those people that at first I might be a little bit shy if I’m meeting a lot of people at one time, but once I get comfortable I am rather loud and outgoing. I will never let someone be left out either. Because I have traveled quite a bit, I am extremely open-minded and up to anything anyone suggested (within reason, of course). I’m also a major music nerd. I couldn’t live without it, because music is the language everyone shares. I can play three different instruments and currently teaching my self how to play the guitar. I believe you should consider me,not only because I have some experience, but because I would be able to relate to the boys of One Direction. Every year for two months, since the age of 13, I leave my home in the United States and visit England. I grew up there the first six years of my life as well. I have also been to Ireland, France, and Australia. I would connect with the lads because we have all traveled. Plus, I already know what it is like to be away from friends and family for a long period of time. Which I am sure those guys have had to endure while touring. It also helps that I’m nearly 18 and close to their age. Well, thanks for taking the time out of your day to read this and I sincerely hope you consider me. Have a great day. Hi! I’m Nicole and I would love to be on the One Direction Show on Nickelodeon. I am a true Directioner, me and my friends are all directioners mostly what we do is talk about them and sing their songs, when are teacher says “face one direction” we always laugh. hi, my name is Bella Saylor. I was adopted two years ago from Latvia and I always loved acting and I do enjoy singing. ONE DIRECTION always makes me happy when I hear them singing. I would like to be part of this show because first I love one direction and second I love acting. Hey. I am a 12 year old singer and I would love to star in this movie. They say you can make your dream come true and I think I can make mine come true. I just really want to be an actress and singer. Hello, My name is Bi’ara’ra Ne’tra Larkin I love to sing. I have Been singing Naturally since I was 4 years old. I am learning to play guitar I can be goofy and silly but serious when it comes down to it. I am 13 years old and will be 14 September 14th. I’ll be in the 9th grade this year for 2013. I am 5’3 Skinny Like size 0. I like One Direction but I am not I repeat NOT! Boy Crazed over them. I will not scream in their faces like most fans I read all the time. I can remember lines good. I still remember lines I did in a play at my school from like 3 years ago. For 8th grade I have B average and was on Honor Role twice. But I really Want this Like I said I can be goofy and silly but serious when it comes down to it So if you want me to audition you can contact me – SKITTLS…SOUP I LOVE UNICORNS!! Hi my name is Bonnie and I would love to be part of this show. I think I would totally fit in. Please consider me!! I am 5’1 and have black hair. I have dark brown eyes and love hanging with my friends. I may start out shy but overcome it to achieve my dreams. I am 14 years old .Thanks!!! Hi if you have any open spots for the show I am a actress dancer and model. I have a ton of experience. I have been acting for 8-9 years and can play practically any character if you would like to see my resumè or ask me any questions feel free to email me. Hi, I am 12 years old, my birthday is on the 13th of September 2000. I go to st. Joseph’s catholic college. I love dancing, drama, singing and gymnastics. I watch figure it out everyday, I love the episodes with Jade Ramsey. I would probably be able to do a lot of different things. I have blue and green eyes. My hair is brown, gold and a bit blond. I like one direction because when I’m shy, I remember when they sing they just let all their worries out and I think how I will always want to be like them. My Name Is Ismael Quevedo, I am a 13 Year Old living in Anahiem California, not far from LA. I have experience in the acting field, and I also have friends in the acting business. I know how difficult it really is to act, but I have been prepared for the business. I am very easy to work with, and very optimistic as I’ve been told so. I don’t know say anything for myself as that would be wrong. I go by what people tell me I do. I would be passionate about working on the show, and would all my effort and 100 Percent on everything we would do. You can Reach me at my Email, Or My Facebook Account. I also have a phone number and will give the director if they contact me. Thank You For Your Consideration. Hi. My name is Colleen, I am 15 years old and I have always wanted to be an actress since I was little, but my family could never afford to move around and go to auditions. I believe I am a good actress and I am IN LOVE with One Direction. If you could just give me a chance, I can finally live out my dream and I could help my family. Thank you. hey I love 1d and if you don’t pick me I’m ok with it. I’m just going to be a fan, you can contact me on my email thx. Hope we get in touch. Hi, my name is Eroby Mota and I’m in Barbizon Modeling/acting School in NYC. When I turned fifteen I did many small productions. I was a model for a line clothes in Dominican Republic. Years later I was an actress and a dancer in a international tv show called ” Sabado Chiquito De Corporan” and also I did smaller theater shows. Please contact me for head shots or any more information. Hi I’m Darla here is some of my basic information. I learn lines really fast. I give it my 110 percent all the time. I can be really weird and funny, a lot of people call me funny, tall, pretty and dedicated. It would be my dream to be on this show! Hi, I am a 14 year old female girl. I love acting and perform in many plays/musicals. It would be an honor to be considered for a role.